A fine evening at the National gallery with Access to Art a small-scale but vital charity of which I am happy to be patron. It affords people who are no longer able to visit museums, galleries and exhibitions under their own steam the possibility of continuing their first hand experience of art. A scheme of minibus excursions collects and redelivers home, small groups of the severely chairbound with their helpers. 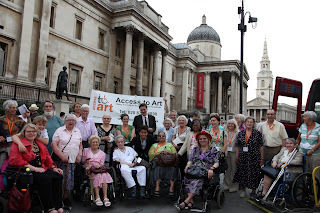 For many it is their only lifeline to an enduring passion for art and, for others similarly disabled, an opportunity to become acquainted with its marvels. Vital to the evening’s great success was the support of Nicholas Penny (seen in the photograph) the National Gallery’s director enabling talks and even music to enrich the charity’s 10th anniversary event. Some of the pictures focused upon were lowered on the walls to facilitate viewing from a wheelchair. Van Gogh's yellow chair at chair level was especially telling. Great to know about this art gallery..